Almost 70 percent of Republicans say Clinton could only win by cheating. 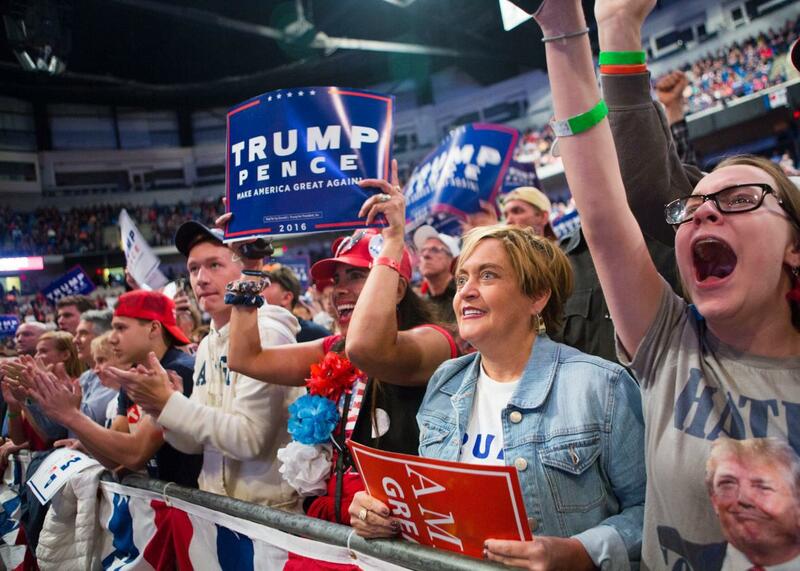 Supporters cheer at a rally for Donald Trump on Oct. 10 in Wilkes-Barre, Pennsylvania. Donald Trump’s message that the election is rigged against him seems to be clearly resonating with Republican voters. If Hillary Clinton wins the election, almost 70 percent said it would be due to “illegal voting or vote rigging,” according to a recent Reuters poll. The survey also found that only half of Republicans would accept Clinton as their president. When it comes to Democrats, 7 out of 10 would accept a Trump victory and less than 50 percent said a victory for the Republican would be due to illegal voting. The poll results come as Trump and his surrogates have repeatedly raised questions about the integrity of the voting process. Even as the Trump campaign has tried to walk back claims that the candidate may not accept results of the race, they seemingly can’t help but qualify an eventual acceptance of an electoral loss. Trump’s campaign manager, Kellyanne Conway, defended Trump’s claims that the election is rigged. “The system is rigged, and especially against the little guy. There’s no question about that,” Conway said on CNN dismissing concerns that Trump was questioning a cornerstone of American democracy. Trump’s claims that the election is rigged seem to be resonating particularly well in Texas and Florida, where 80 percent of Republicans believe voter fraud is widespread. And more than 8 in 10 of those who said fraud is widespread believe Trump would win in a clean race, according to a CBS poll published on Sunday.